*Check before Charge: Battery is alive, “OK” to be charged. 1. The BT705 can’t test 6V battery! 2. Do not connect the tester to a voltage source greater than 30VDC; otherwise you may damage the tester. 3. If you are testing inside a vehicle, make sure all accessory loads are cut off, the key is not in the ON position and the doors are closed. 4. Before starting the cranking test, inspect the alternator drive belt. A belt that is glazed or worn, or lacks the proper tension, will prevent the engine from achieving the rpm levels needed for the test. 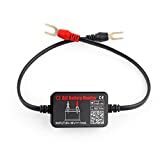 Provides an Easy Method to Connect a Multimeter to the Vehicle Electrical System to Diagnose Hidden Battery Drain. M10x1.0 Flare Nut European/Domestic 4 pack. 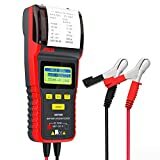 Ancel BST500 Battery Tester can easily, quickly and accurately measure12v car and 24v heavy truck the actual cold cranking current capability to judge the health condition of the battery itself. BST500 battery tester can detect common faults of both starting and generator charging systems, which helps you achieve quick repair to the vehicle problems. Eight lines with backlight LCD display and humane language prompted interface. Does not emit light, no heat, no discharge, no spark, no operating dangerous. Automatic temperature compensation function With ripple voltage test function Multi- language menu display. 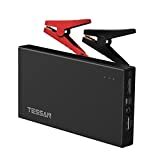 Applicable to a variety of models, all kinds of batteries , and a variety of system mode. Directly detected in the car , do not need to remove the battery. Directly test the battery of the loss of electricity , bad cell battery. The Schumacher BT-100 100-Amp Batter Load Tester is great for everyday use on 6V and 12V batteries. It can test load, battery condition, starter motor draw, and offers complete charging system diagnosis. Its shock-resistant meter is housed in a sturdy steel case that has a durable baked enamel finish. It also features a rubber insulated carry handle for your safety. The BT-100 comes equipped with super-grip battery clamps and a top-mounted rocker switch, making it very easy to use. 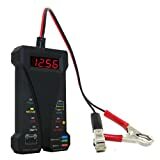 The MOTOPOWER MP0514A 12V Digital Battery Tester Voltmeter and Charging System Analyzer with LCD Display and LED Indication provides a quick reading to determine if a vehicle battery needs a jump or replacing. Test Range – 4-20V DC testing range for all types of 12Volt batteries. (NOTE: If voltage is under 4Volt, the LCD reading is “LO”; If voltage is above 20Volt, the LCD reading is “HI”. 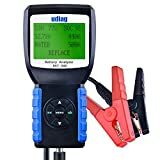 Accurate – With a four-character lighted digital display, this battery voltage tester is easy to read with accuracy. LED Indication – Colored LEDs indicate different status of battery or alternator. Safety Protection – Reverse Polarity, Short Circuit and Overload protections. Best Quality – Black Rubber Paint Housing with 30Amp Alligator Clamps. ACDelco Professional Battery Terminal Ends are durable and are the high quality replacement ideal for many vehicles on the road today. These premium aftermarket replacement battery terminal ends are manufactured to meet your expectations for fit, form, and function. PROPOSITION 65 WARNING: Battery posts, terminals and related accessories contain lead and lead compounds, chemicals known to the State of California to cause cancer,birth defects and other reproductive harm. Batteries also contain other chemicals known to the State of California to cause cancer. Wash hands after handling. 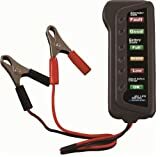 WirthCo Battery Doctor Battery Quick Disconnect Caps are designed to fit top post batteries, 4 to 6 gauge wire and side post batteries with standard post adapters. They are manufactured of copper-zinc plated steel and rated 500 amperes continuous and 800 amperes surge at 12 Volts. They attach to the battery terminal by clamping down on the cap and detach by lifting the cap to remove from the battery terminal. The caps are color-coded with red and black and come as a pair. For over 30 years, WirthCo has been a prime manufacturer of practical products for making life easier and safer. WirthCo Battery Doctor Battery Quick Disconnect Caps are designed to fit top post batteries, 4 to 6 gauge wire and side post batteries with standard post adapters. They are manufactured of copper-zinc plated steel and rated 500 amperes continuous and 800 amperes surge at 12 Volts. 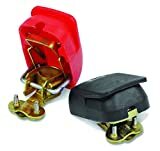 They attach to the battery terminal by clamping down on the cap and detach by lifting the cap to remove from the battery terminal. The caps are color-coded with red and black and come as a pair. For over 30 years, WirthCo has been a prime manufacturer of practical products for making life easier and safer. California Prop 65 – Warning, This product contains chemicals known to the State of California to cause cancer, birth defects or other reproductive harm. Schumacher’s Terminal Cleaning Brush for top and side terminals fits positive (+) and negative (-) terminals. 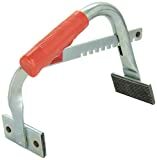 Clean and spread battery cable terminals with this plier-type tool. Color: Black. Manufactured in Taiwan. The OTC battery terminal service kit is used to work on battery terminals. It includes one 4611 battery terminal puller, one 4612 3-way battery post cleaner, one 4613 battery pliers, one 4614 side terminal battery wrench, one 4615 long-side terminal wrench, one 4616 battery terminal wrench 10mm, one 4617 side terminal battery brush and one 4622 battery cable cutter. All included in a blow molded case. 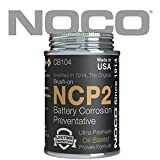 The CB104S NCP2 Battery Corrosion Preventative Compound is formulated to make all surfaces impenetrable to corrosion-causing acid fumes, which reduce battery life and cranking ability. Its ultra-premium oil based formula applies a viscous protection seal that does not dry or evaporate, providing a long-lasting, lifetime . Suitable for all types of vehicles, as well as, battery terminals, battery cables, battery boxes and much more. 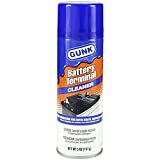 Gunk Battery Terminal Cleaner cleans corrosion from battery terminals, cables, and surrounding surfaces. Neutralizes acid on battery terminals and surfaces. Safe for use on electrical connections in next-generation and/or hybrid vehicles. 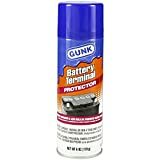 Gunk Battery Terminal Protector provides a special protective coating which can be sprayed on battery terminals, connectors, battery trays, holder bolts, and bracket hardware. 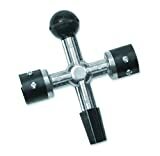 Coil spring cutters polish the battery contact while stainless steel brushes clean the cable terminals. Pico produces an extensive line of proprietary design installing and removal tools. When removing, installing or transporting a battery be sure you have a good grip on it. With this side battery lifter you will not have to worry! The rubber pads are adhered with a super strong adhesive to ensure a strong and sturdy grip. It’s simple to use and easy to store.